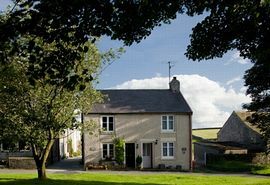 Candlelight Cottage is a romantic, oak beamed cottage overlooking the green in the picturesque village of Litton. 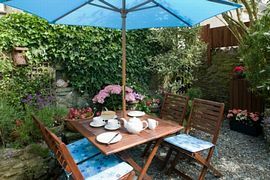 Recently renovated and beautifully furnished to a very high standard, this 5 star self catering cottage provides all the home comforts and modern conveniences you would expect and more. 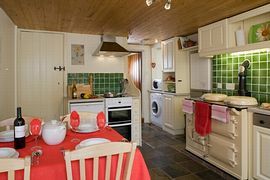 A peaceful retreat, with its soft leather sofas, AGA and luxury bathroom with separate shower, Candlelight Cottage is the perfect central base for sightseeing, walking, caving, fishing, climbing, cycling, sailing or simply getting away from it all. 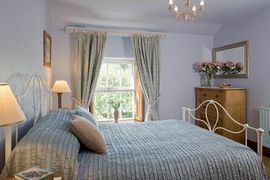 On arrival, you are welcomed personally by the owners, who include a generous welcome pack including locally sourced products and fresh flowers. Peak District maps, leaflets and books are provided for guests' use. Litton lies at the heart of the Peak District, almost where the White Peak and Dark Peak meet. Ideally situated for walks through limestone dales such as Dovedale, Millers Dale, Monsal Dale and Lathkill Dale or across gritstone edges and moorland such as Stanage Edge, Kinder Scout and Bleaklow. Chatsworth House, Haddon Hall, Bakewell, Buxton, The Pennine Way, Limestone Way and many cycle trails are all close by. Litton benefits from an award winning village shop and The Red Lion pub, featured in The Good Pub Guide. A personal welcome and service.Walks from the door. Enclosed and very private patio style garden. Garden furniture and a BBQ are provided in summer. Local Services: Litton village has a pub, shop and good bus services. Travel details and directions are available on our website.Specific directions are provided on booking. For the comfort of all our guests, Candlelight Cottage is totally non smoking and sorry, no pets or children under the age of 8 years. During Peak Season we are unable to accept bookings for short breaks more than 2 weeks in advance of the start date. At other times of year they may be booked further in advance. Please see Terms and Conditions on our website for our cancellation policy. The cottage is open all year round and short breaks are available at certain times of the year. Special offers or late deals can be available. English Tourist Board GOLD award and "Walkers Welcome" scheme.